2 square bounce aims to develop the concepts of finding space, anticipation, teamwork and deception. Players form pairs and take sides opposite each other on the court. The player with the ball serves. The ball must cross the line above waist height. 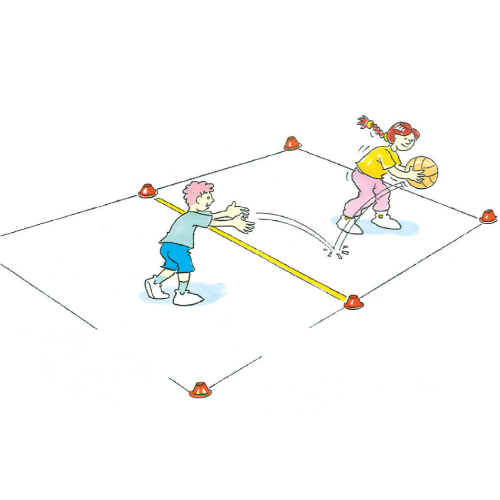 Play continues until 1 player cannot return the ball after 1 bounce, or the ball is thrown out of court, or the receiver drops the ball. The serve alternates between players. Play to a specified number of points or set a time limit. 1 point is scored for winning the rally. Where is the best place to bounce the ball when you serve? Where should you stand ready to catch the ball on the bounce?